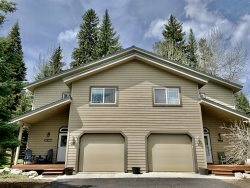 Better Than Home- Quiet Wooded Condo Retreat Immaculate and quiet, you will love this darling one level condo in McCall! There are two beautiful bedrooms and two full bathrooms, a full kitchen with all appliances and breakfast bar. The living room has a fireplace and all the comforts of home. This property is an end unit backed up to forestland, providing privacy, wildlife, and tranquility while enjoying the back patio and hot tub! Walk or bike to the lake or downtown, which is only a few blocks away. Expect to be spoiled! This wonderful home comes fully equipped with everything you need to unwind for a perfect getaway, including Cable/High Speed Internet, Color TV with Roku device and stereo. A variety of music, reading library, and games for your enjoyment. All kitchen appliances for the cooking connoisseur (stove/full oven, microwave and dishwasher). There is plenty of parking for all your vehicles, toys, and a single car garage with opener. The condo boasts 'hotel like amenities' such as little soaps, shampoos, lotions, and quality linens for a restful night's sleep. The master bedroom has private full bath and a separate exit to the patio and hot tub. Each bedroom has a queen Tempurpedic bed top, full closets, extra pillows and blankets. Unwind after a long day of hiking or skiing on the private patio overlooking the wooded back drop in the large secluded private four person hot tub. Or, cookout on the two burner Char-Broil Infared Gas Grill, watching the local wildlife of mule deer and resident fox! Less than a mile walk will bring you into downtown McCall, which features a variety of shops, restaurants, the famous Manchester ice skating rink, public beaches, the marina, and the Payette Lake. Ponderosa Park is a short bike ride away and in the winter, Brundage Mountain Ski Resort is 10 miles (22 minutes)- just a short drive away. Pets: Pets are only allowed in units that are pet friendly, this is not one of them, there will also be an additional fee charged for pets. Undeclared pets are subject to extra charges and possible eviction from the rental without a refund. Please if it is a pet friendly rental to pick up after your pet inside the unit as well as outside. Air Conditioning: Most vacation rentals in the McCall area DO NOT HAVE AIR CONDITIONING. When we have the warmest days in McCall, nights typically cool down enough to not need air conditioning. If air conditioning is not listed on the amenities, the unit does not have air conditioning. Most units will have fans in them. Generally the best way to deal with the warm temps is to close all windows and shades in the day time, and then open the windows in the evening when it cools off. All amenities: Note that all amenities are subject to change without notice and are not guaranteed. Amenities such as hot tubs and pools are susceptible to closure for maintenance. We will always do our best to offer all our amenities listed, but at times this is our of our hands and we can not give any discounts or refunds based on an amenity not being available during your stay. 4 wheel drive highly recommended in the Winter. We are not responsible for any winter storm situations such as power outages, road closures ect.